I spent the majority of Monday on the hunt for a red woollen tank top and rosary beads. Last Wednesday, my evening was taken up stitching a big piece of white fleece to create a sheep costume. And on Thursday, I'm due to head out to the rugged island of Inis Mor, at one of the bleakest times of the year. This little festival celebrates the cult Irish television show Father Ted. I've loved Father Ted since I first clapped eyes on it, but I've never been to Tedfest. I met a great guy at another festival once, who started the whole thing off many years ago. It sounded like brilliant craic - a great gang getting together and having a giggle, all the while dressed as nuns and priests. My friend has been a few times and had a ball, so we booked our tickets as soon as they were released this year. 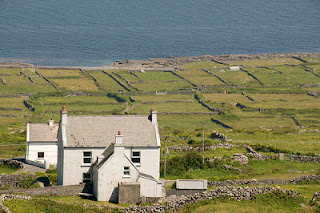 We also booked into the Aran Islands Hotel, right in the middle of the action, for €299 for three nights. While the festival is small, it's pricey - the tickets cost €150, and you still have to eat (and drink) on top of that. When we made contact with the Receiver he informed us that they were considering whether or not to open the hotel for Tedfest. We have been in touch a number of times since then but at the time of writing they are yet to make a decision. Obviously this whole matter is beyond our control and as soon as we know anything of any certainty we will let you know. In the meantime if you have any queries we are afraid that we can only refer you to the Receiver. I was straight on the ball, calling all of the accommodation listed on the island. My heart, however, sunk. I had heard that everywhere was booked up for the duration. The festival uses all of the accommodation on the small island. The chances of getting a room looked slim. I spoke to one lovely woman for a while, who was full of sympathy and kind words. She couldn't belieeeeve the mess we were in. If I'd have stayed on the phone with her any longer, I'd say she'd have offered me her own bed. She did say, however, that the hotel had been closed for at least a week, probably more. My friend had rung the hotel last week to confirm our reservation. The owner had assured her that our booking was final, and that everything was in place. If the islanders I spoke to earlier were correct, then he was saying this from a hotel that had been locked up and shut down. As someone pointed out on Facebook, receivership takes a while. They must have known the trouble they were in, while they were taking bookings (and money!) from a lot of people. Over the course of the evening, it became clear our luck was out. Each person I spoke to said they were booked up. One woman got a bit thick with me for even calling, asking why on earth we were all suddenly getting in touch when the hotel had been closed for two weeks. Because we're all a bunch of fecking thrillseekers, I told her! We live on the edge! We all made a plan to call her in quick succession even though we all knew about this weeks ago, of course! The Facebook page for Tedfest was hotting up. People had booked flights, ferries, trains, time off work. One woman estimated that she had already spent €2500 to get there... money which is near impossible to get back. 48 people were booked into the hotel, which I had heard is around a third of the capacity for the festival itself (though don't hold me to that). 48 people who, if they still want to attend, can only stay on the island if they camp. It's February. On the Aran Islands. That is all. There's a happy ending for me and my friend. A short while ago, a woman rang me who runs a b&b about half an hour away from the action. After answering so many frantic calls, she decided to double check with her bookings to see who was coming. Luckily, she had a cancellation, which she offered to me. The fact that she rang me over anyone else was pure luck - she hadn't taken any other numbers. As for everyone else? Only time will tell. The hotel is definitely not opening this weekend (as if any receiver would let them). At the time of writing, everything is going ahead as planned. Questions are being asked about refunds, which is a tricky issue - can the organisers be held accountable for something out of their control? I really feel for them, as it's undoubtedly an organisational nightmare for them to deal with two days before the festival starts. They can't build rooms, or open hotels, or really do anything to rectify the situation at all. But 46 people have spent €150 on a weekend they have no way of attending. It's a bit of a mess, alright.